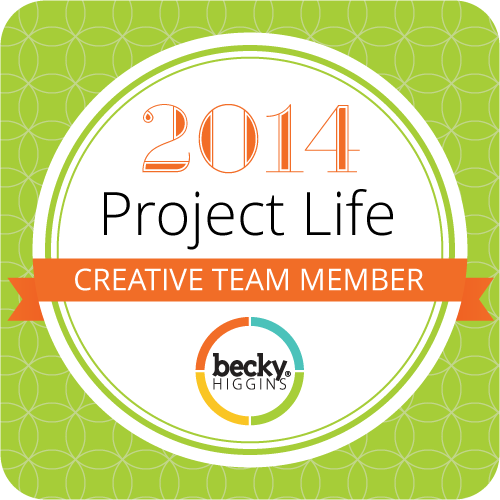 My Scrap Space – It Works For Bobbi! Published on December 12, 2007 August 9, 2016 by Bobbi-Jo G.
This is it so far. I’ve set up my scrap space in our basement just off of the rec room. In the near future, I’ll be moving it upstairs when my youngest is old enough to share a room with her big sister (probably in about a year). The room upstairs will be turned into my scrap room/ guest room. I’ve got a vision, folks! Anyway, for now this is where I’ll be creating. 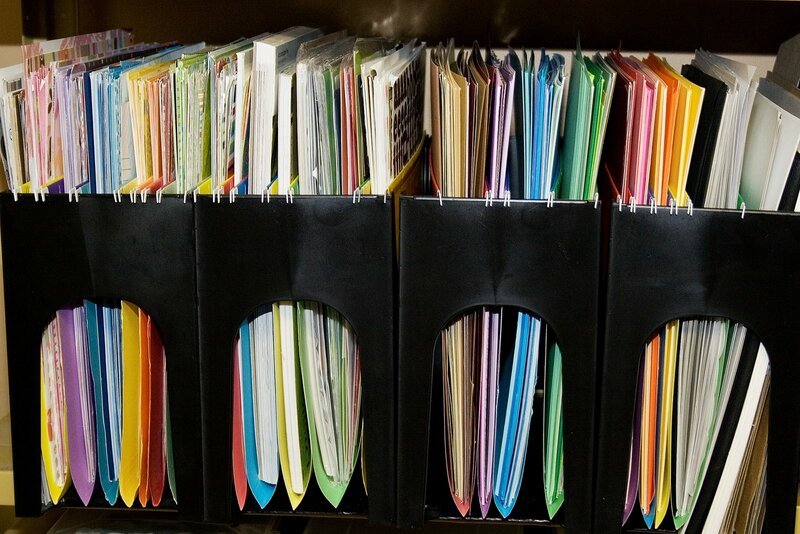 My favorite find (though I’m sure it would be obvious to most) was my 12X12 paper storage solution. I simply bought some inexpensive legal size hanging file holders and voila! Now I’ve got storage for my 12X12 patterned papers, cardstock, and 12X12 embellishments/stickers. I’ve organized all of my papers by color (cardstock separately) so now when I create a page, finding what I need is easy. I also kept the co-ordinating paper sets together to make it even easier. You wouldn’t believe how stressed I was making myself about finding some way to store my 12X12 papers! Sheesh! Anway – problem solved! I also like my baskets (bought at Canadian Tire for $7 for the set) which hold all of my stamps (foam and acrylic). 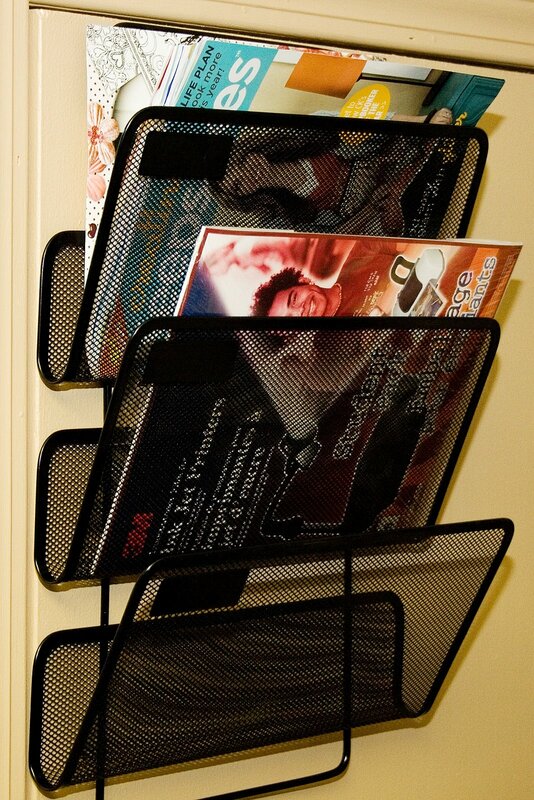 I hung up the 12X12 clipboard on the wall above the desk so I can display my latest pages, and my hubby found a great little magazine rack at Staples that he attached to the cold room door to hold my magazines (before I tear them apart and file them in my nifty idea binder). Previous Kitchen and a tree! I WANT that space! 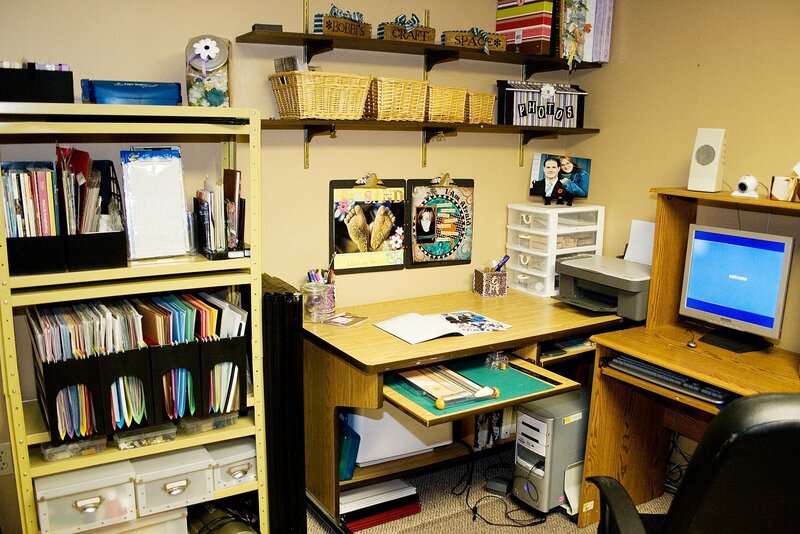 Your desk area is so neat and tidy and perfect! I love it! And you and I are a lot alike in having things organized! Your house is looking so good! Fabulous! I am having some coveting issues right now! 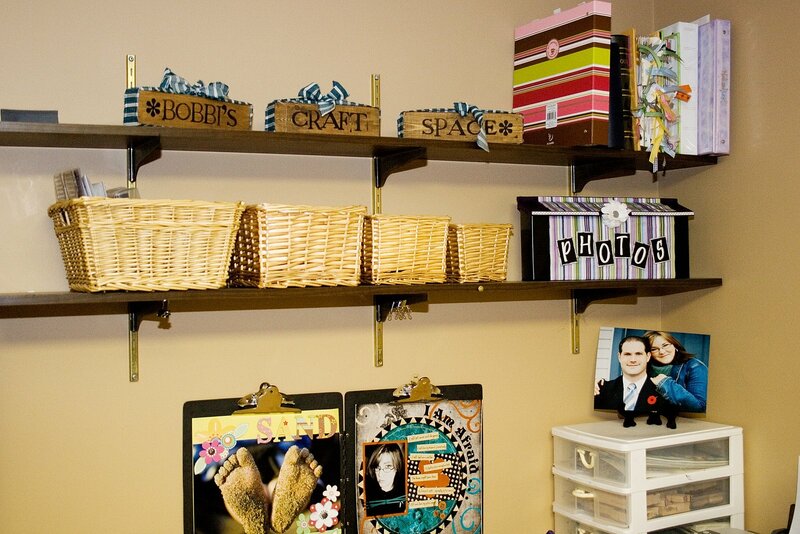 Just kidding, but it looks great, and I love the idea for the paper storage. I always have a hard time figuring out how to store my paper.